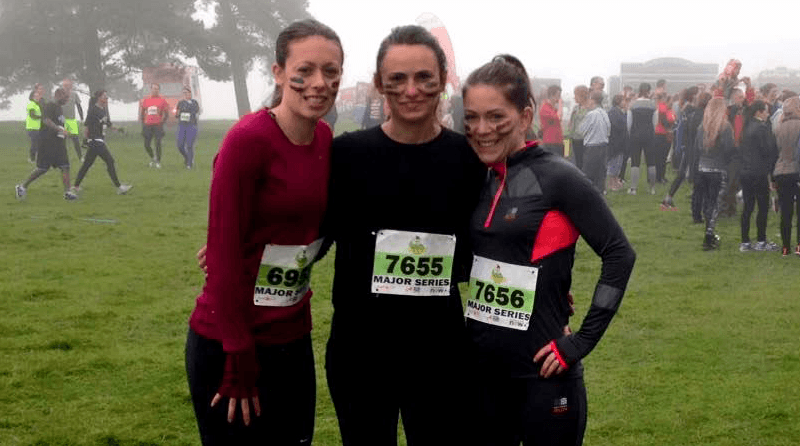 On 3rd October, three brave Parenta employees – Samantha Russell, Lucy Upstill and Natalie MacDonald – stepped forward to take on a mud obstacle run called The Major Series to raise money for the Trust. The race took place on a 3000 acre private estate which had rolling hills, woodland, boggy trenches and plenty of mud. The day started off chilly, with a roving mist near the start line. Safe to say, Sam, Natalie and Lucy were nervous about taking on such a challenge, but were determined to see it through! Representatives from British Military Fitness took the warm up and gave some words of encouragement to everyone, before setting off the 11am wave of runners. Along with hundreds of other participants that day, the girls plunged themselves into freezing cold “stench” trenches, hauled themselves over cargo nets, crawled in mud and made their way to the finish line – one obstacle at a time. After suffering through nearly 2 hours of running and mud, the girls came face-to-face with one final obstacle: a huge water slide down a steep hill! Seeing fairy liquid aplenty, the girls coated their clothes in a frothy white mass of bubbles before throwing themselves down the slide. Reaching the end of the race was a relief, and a well earned bowl of porridge was enjoyed by all. Thanks to their efforts, the girls managed to raise £100 for the Parenta Trust. This money will be put towards building a pre-school in Uganda in 2016, so it was well worth the coldness, fatigue and bruises. There’s even been talk of the girls taking on similar challenge for the Trust again next year….watch this space!